Who said, "What you are about to do, do quickly"? TODAY agriculture is in deep trouble. It is facing a crisis which even now is affecting the cost and the quality of the food on your dinner table. It is easy to see that widespread disease and famine loom on the horizon for the poor, "have-not" areas of the world. But few are aware that an agricultural crisis of equal - and possibly greater - magnitude is in prospect for that third of the world we call the "have" nations. 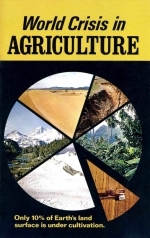 We in the United States, Canada, Western Europe, Australia, South Africa and the other "have" areas of the world are dazzled by the storybook pronouncements of "scientific agriculture." We have become so accustomed to talk about "burdensome surpluses" that we seem to believe we are immune to a food crisis. But in the very near future, the growing crisis in agriculture could easily cause YOU to be numbered among the seriously sick and diseased -'or among those hapless millions who go to bed at night with empty, aching stomachs. Please click the above PDF icon(s) to view or download the full Booklet in PDF format.